Hello, my name is Kaleigh Dubring and I’m with the Catctus Mat Company. This is an instructional video on how to properly clean your kitchen mat. I n order to insure the appearance and durability of your kitchen mat, please listen and follow the following instructions in order to minimize wear and tear of your kitchen mat. All you need to thoroughly clean your kitchen mat is warm water, mild dishwashing detergent, a deck brush and a secure rack with which to transport your mats between cleaning and drying. Notice that I was able to easily move all dirty kitchen mats at once as opposed to lifting each mat individually using the Cactus Mat Rack Transporter. Once you have your warm water and mild detergent, be sure to cover all surface areas of the mat using your deck brush. Pay special attention to the holes as grease may tend to build up there. Once you have cleaned both sides of your mat, hang your mat on a secure rack so that you may hose down all remaining soap residue. Folding mats may cause them to crack. You should never put your mat in a commercial washer. You should also never use harsh chemicals such as bleach or a heavy degreaser. Once you’ve hosed off all remaining soap residue, hang your mat so it can dry. Before returning your clean kitchen mats to service, be sure that all greasy floors have been cleaned and any sticky liquids have been mopped up. It is important to clean your mats daily to prevent any kind of grease build up. Take this pan of bacon grease, would you simply run warm water on it and put it away? No. Would you go out and buy a heavy degreasing solution in order to clean it? No. The simple answer is warm water, mild dishwashing detergent and a brush and the grease is gone. Thank you for watching this instructional video by Cactus Mat. Watch this video to learn how to properly clean your rubber anti fatigue kitchen mats. All you need is some warm water, mild dish detergent, deck brush, and a secure rack to transport your anti fatigue mats between cleaning and drying. Hello, my name is Cahleigh Dering and I'm with the Cactus Mat company. This is an instructional video on how to properly clean your kitchen mat. In order to ensure the appearance and durability of your kitchen mat, please listen and follow the following instructions in order to minimize wear and tear of your kitchen mat. All you need to thoroughly clean your kitchen mat is warm water, mild dishwashing detergent, a deck brush, and a secure rack with which to transport your mats between cleaning and drying. Notice that I was able to easily remove all dirty kitchen mats at once, as opposed to lifting each mat individually, using the Cactus Mat rack transporter. Once you have your warm water and mild detergent, be sure to cover all surface areas of the mat using your deck brush. Pay special attention to the holes, as grease may tend to build up there. Once you have cleaned both sides of your mat, hang your mat on a secure rack so you may hose down all remaining soap residue. Folding the mats may cause them to crack. You should never put your mat in a commercial washer. You should also never use harsh chemicals such as bleach or a heavy degreaser. Once you've hosed off all remaining soap residue, hang your mat so it can dry. Before returning your clean kitchen mats to service, be sure that all greasy floors have been cleaned and any sticky liquids have been mopped up. It's important to clean your mats daily to prevent any kind of grease build up. Take this pan of bacon grease. Would you simply run warm water on it and put it away? No. Would you go out and buy a heavy degreasing solution in order to clean it? No. The simple answer is warm water, mild dishwashing detergent, and a brush, and the grease is gone! Thank you for watching this instructional video by Cactus Mat. Properly clean your Cactus Mat kitchen mat by following these simple instructions! With only warm water, mild dishwashing detergent, and a brush, your mats will be clean and ready for service again. What is the recommended way to clean these mats? According to the manufacturer, use hot, soapy water and a mop, or a soft bristle brush. Stay away from power washers, steam cleaning, dishwashers, harsh detergents like chlorine, and stiff bristle brushes. What is the difference between "grease-resistant" and "grease-proof"? Grease-resistant mats are designed for limited exposure to oils, while grease-proof mats are designed for heavy exposure to grease and oil. Will my Cactus Mat be the exact size listed on the product page? The sizes on these mats are listed with nominal sizing that might vary by up to 5-8%. Because the properties of both vinyl and rubber can expand or contract based on its environment, both hot and cold temperatures can affect the sizing of your mat. By listing the nominal sizing that is standard in the industry, comparing mats across varying brands is much easier regardless of the natural sizing differences due to material. 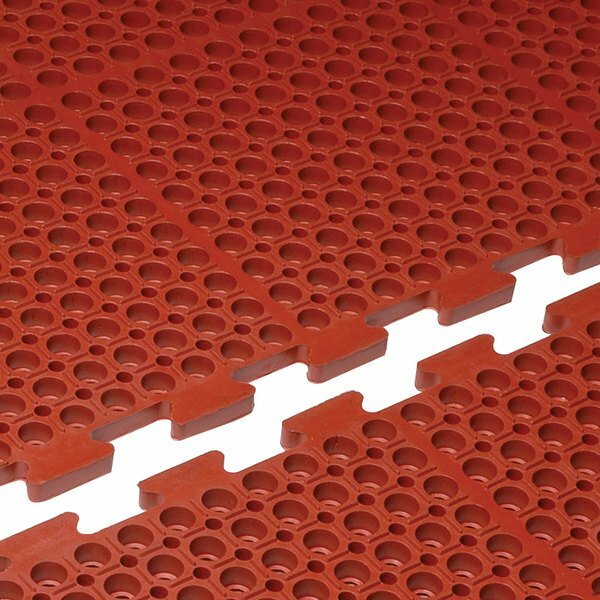 Keep your employees safe and comfortable with this Cactus Mat 4420-RC VIP Duralok 3' x 5' red center interlocking grease-resistant, anti-fatigue, and anti-slip floor mat! This center-style mat features molded-in connectors on both short ends, eliminating the need for additional connectors or bevels. Specifically designed to be used between two end-style VIP Duralok mats or with a combination of center-style and end-style mats (sold separately), this floor mat allows you to customize your floor mat system to meet the needs of your business. This floor mat has smooth, stub edges so that it can fit against the bases of cabinets or equipment without posing a tripping hazard. Plus, it has excellent anti-fatigue and anti-slip properties to help prevent injuries due to employees walking or standing for extended periods of time. It's great for wet areas since it offers drainage through the continuous hole pattern. Use it behind counters, in greasy kitchen and prep areas, and in serving areas to provide the best protection for your employees. This product can expose you to chemicals including 2-Mercaptobenzothiazole, which are known to the State of California to cause cancer, birth defects, or other reproductive harm. For more information, go to www.p65warnings.ca.gov. WARNING: This product can expose you to chemicals including 2-Mercaptobenzothiazole, which are known to the State of California to cause cancer, birth defects, or other reproductive harm. For more information, go to www.p65warnings.ca.gov.